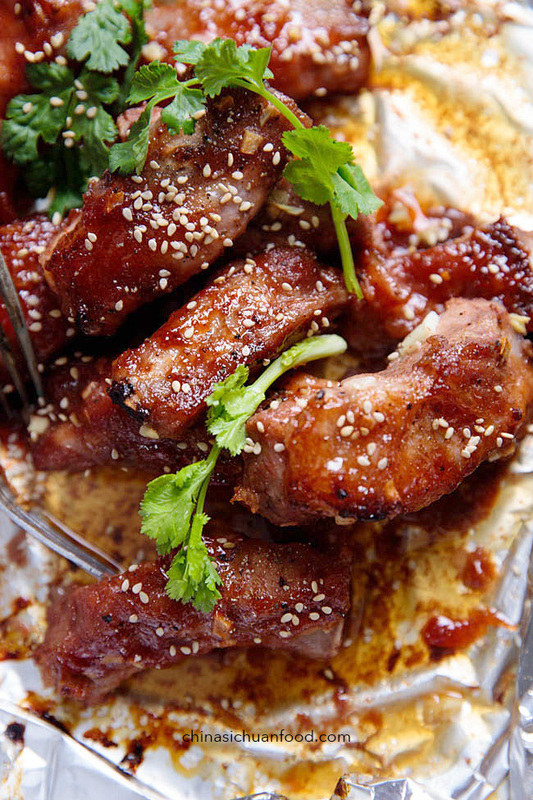 A super easy Chinese style BBQ Ribs with hoisin sauce. Hoisin sauce (海鲜酱) is a combined thick and fragrant sauce from Chinese cuisine. In most cases, we use it as a glaze for all types of BBQ and stir fries. The Chinese name is quite misunderstanding. 海鲜酱 literally means seafood sauce, but there is no seafood ingredients included. Usually fermented soy beans (豆豉), garlic, fermented tofu (豆腐乳), Chinese five spice powder are common ingredients. 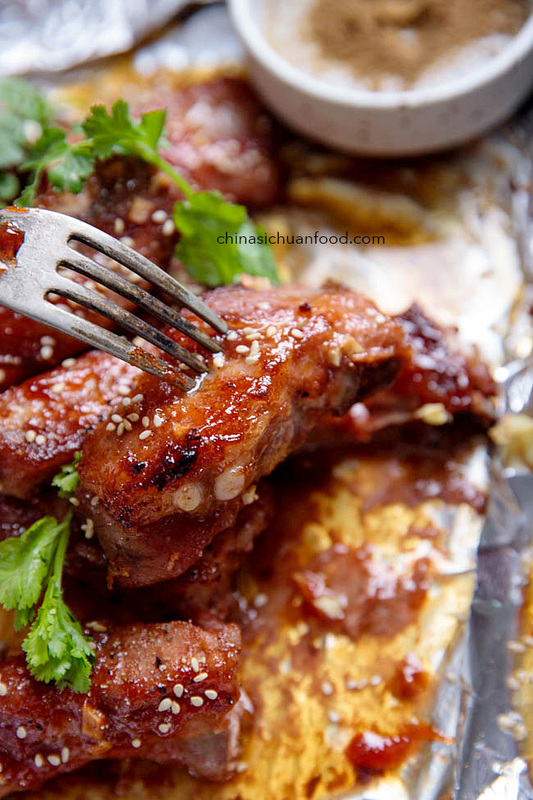 I usually make Char Siu with hoisin sauce whenever there is no char siu sauce in the kitchen cabinet. 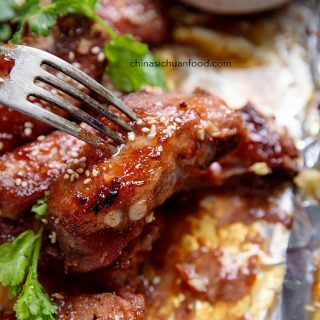 Pork is the most popular meat ingredients comparing with beef and lamb, cause Chinese people believe odd raw taste of pork is the lightest. Unlike pure meat cuts, all bones (ribs and big bones) carries a low lever of odd raw taste (膻味). It is quite naughty and may spoil the final flavors. Several ways can be adopted to removing the strange taste. Those including soaking in clean water, blanch the bones with hot water (skin the floating on the surface for a soup) or adding wine and spices. We use the first option since the ribs have been already cut into small pieces and soaking can clean the impurities efficiently. 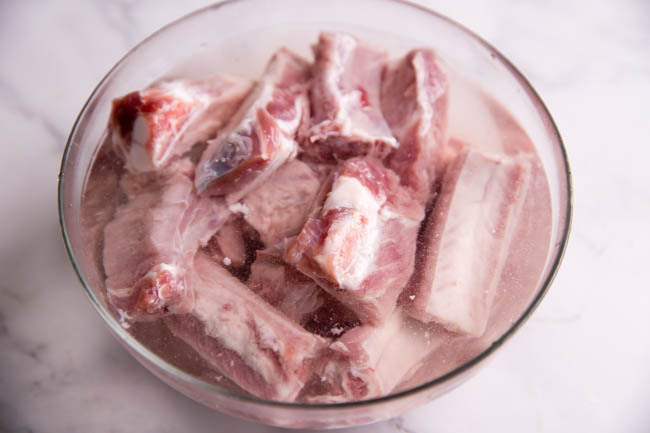 Change the water at once after the first 10 minutes of soaking so the ribs can be cleaned in a more clear environment. Pre-soak the ribs with clean water for 30 minutes. During the process, the clean water turns slightly pink or red. Change the water once after the first 10 minutes. Then drain completely. Whisk all of the marinating sauce in a bowl. Pour the marinating sauce to the ribs. Set aside for at least 4 hours or overnight in fridge. 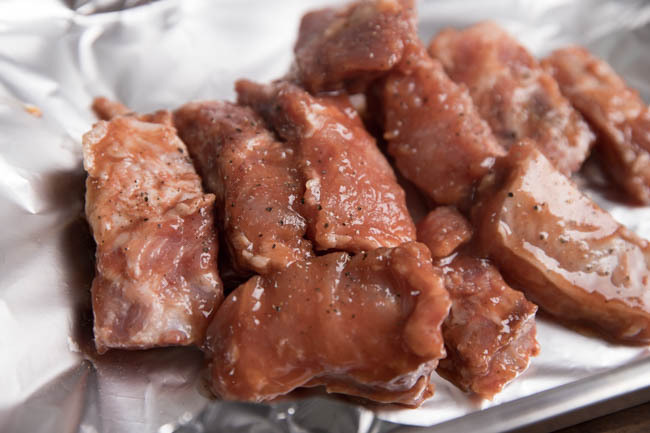 The most difficult part of cooking ribs is to keep them tender after cooked and the main method is to prevent them drying out. 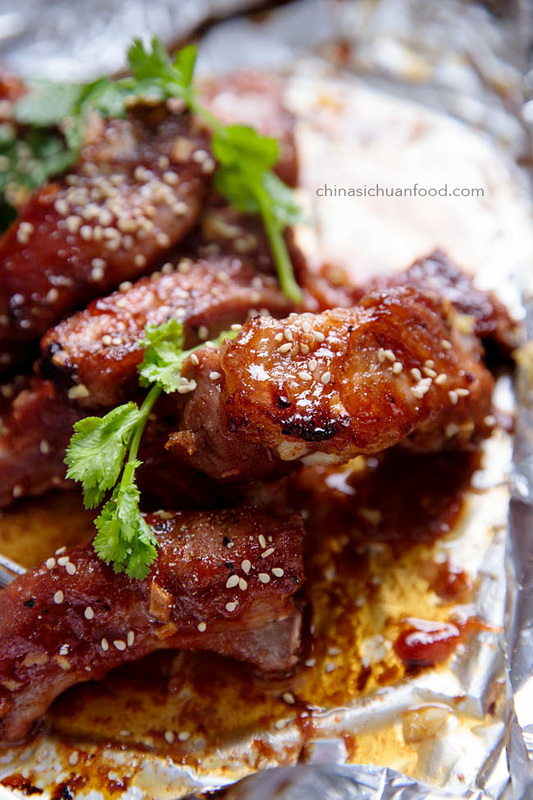 In a classic Chinese steamed ribs dish, the work is completed by a small layer of starch water. Low temperature can reduce the water releasing. An extra helpful tool is a foil. 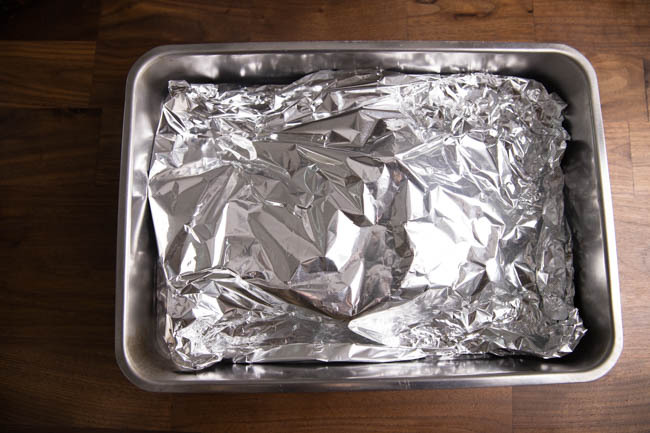 Wrap the ribs completely with foil to create a inclosed environment helps to keep the water too. Get a lined baking sheet, place only the ribs in. 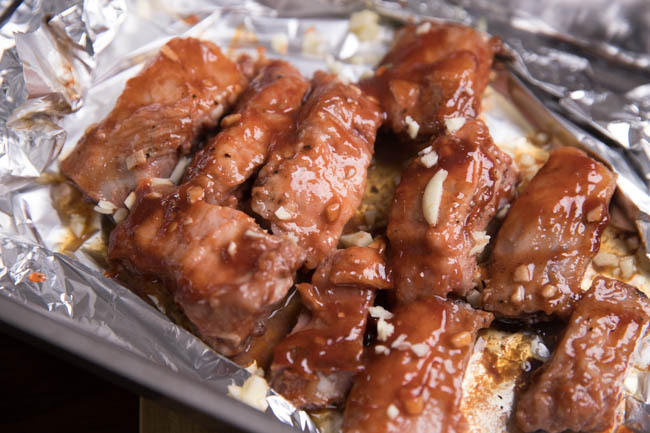 Wrap the ribs with foil paper. Pre-heat oven to 180 degree C.
Adding some chopped garlic before the last 10 minutes of roasting can give the ribs a naughty garlicky flavors. 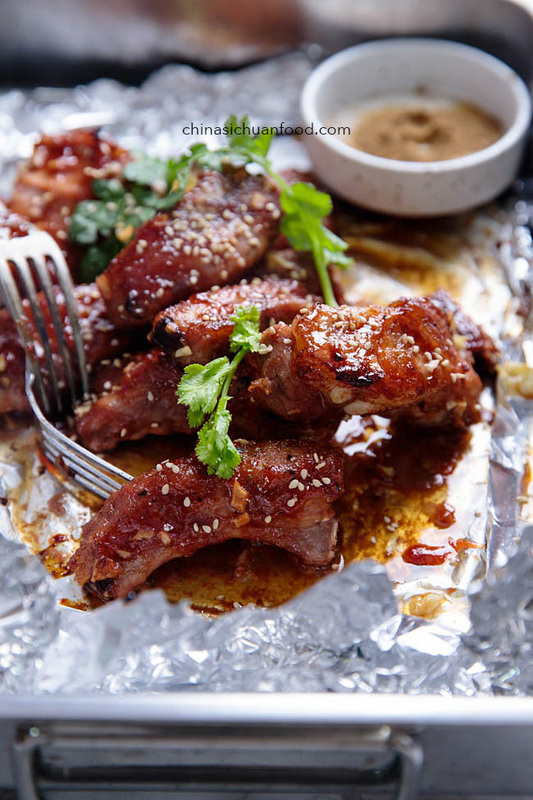 Black pepper is another good partner of hoisin sauce. Place the baking sheet in the middle rack and roast for 40 minutes (depending how soft you want the ribs to be). Take the upper foil off and then brush the honey water. Rise the oven temperature to 200 degree C. Continue roasting for around 10 minutes until well colored. Sprinkle freshly ground black pepper and toasted white sesame seeds. Serve hot. I highly recommend serve those roasted ribs with fresh salad or light and healthy soups. You can try the following options.